Humpback whales are part of the suborder of cetaceans called Mysticetes, which describes whales that use baleen to filter-feed. All baleen whales lack teeth, instead having sheets of baleen, a hard but flexible material made of keratin just like human hair and fingernails. The length and number of baleen plates differs from species to species. Baleen whales take huge gulps of food and seawater, then they close their mouths and use their tongues to force the water out of their mouths, trapping the food in the baleen. Hawaii. The North Pacific population was once hunted to near extinction, but since being protected it has been steadily increasing. They are still hunted in Antarctic waters by Japanese whalers. Like all baleen whales, females are larger than the males. The situation is opposite for the toothed whales. Females can grow to over 14m (45 feet) and weigh up to 40 tons after feasting all summer in northern waters. Once humpback whales begin their migration south, they do not eat again until they return to BC and Alaska the following spring. The warm waters of Hawaii support very little planktonic life, so there is no food for the whales to eat while they are there. Females can lose 17 tons during the winter when they have a calf, with milk production using up the majority of her fat stores. Humpbacks are a bluish-black colour with white on their underside. Humpbacks have the largest pectoral fins of any whale species, extending 4.6m or 15 feet. As adults their tails are 5.5m or 18 feet across. White pigmentation patches on the underside of the tail flukes, along with scratches and scars are unique to each whale, and are used to identify individuals. Humpbacks have many throat pleats that are made of a stretchy fat material. When they open their mouths to feed, the throat expands, allowing the whale to take massive quantities of water and food into their mouths. The throat pleats run 2/3 the length of the body, averaging 9m (30 feet), all the way to the whaleʼs belly button. Another unique characteristic of humpback whales is a series of bumps that run along the top jaw and on the pectoral fins. These structures are called tubercles and contain a nerve hair at their centre. The nerve hairs detect pressure changes in the water, allowing the whale to detect swarms of krill or fish in the otherwise dark waters. 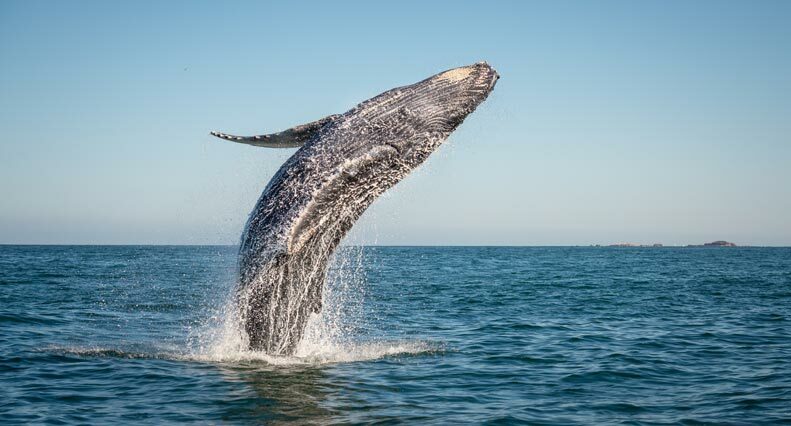 The whales can also detect the pressure changes as they reach the surface, allowing them to time the opening and closing of the blowholes for breathing. Male humpbacks are the only whales that can sing. It is believed that males sing during the mating season to attract females and warn other males of their presence. A maleʼs song is a series of exact notes that lasts an average of 20 minutes before it is repeated. All the males in one population sing the same song, with the song changing slightly each year. It is not known how all the males know to change the song. Males hang up-side-down and remain still while they sing to get the furthest transmission of their song. Once a female is pregnant, she will give birth to a single calf 11 to 12 months later. Calves will nurse for one year and separation from their mother occurs once the pair returns to Hawaiian waters. Female humpbacks reach sexual maturity at about 7 years of age, and will have a calf every 2 years on average. Humpbacks are famous for their unique way of hunting fish called bubble-net feeding. A group of humpback whales gather together, with several of the members diving deep down below a school of fish. They swim towards the surface in a spiral pattern releasing bubbles as they ascend. Fish are afraid to swim through the bubbles, thus they create a bubble net, herding the fish towards the surface. All the whales in the group open their mouths as they reach the surface, swallowing massive quantities of fish. Humpbacks typically dive for 3 to 12 minutes, but they can exceed 20 minutes if they so desire. They are known as the most acrobatic whale species in the world, breaching, spy-hopping, rolling, tail fluking and pectoral fin slapping. These behaviors may be a form of play, communication or done to release barnacles and whale lice from their skin.